There seems to be a trend in development today… maybe you’ve noticed it. Perhaps because they’re woefully overburdened with spans of control that are inhuman and inhumane, or perhaps because training and development budgets have been cut to the bone yet again leaving in their wake a sense of scarcity, or perhaps because the corporate ladder has narrowed dramatically and the rungs that are left look bit rickety – whatever the reason, managers are willingly accepting their employees’ lack of interest in development. Working with several organizations recently, I’ve experienced many managers who respond with relief when their employees express a sentiment like, “No thank you… I’m fine just as/where I am” in response to development opportunities. There seems to be a growing sentiment that limited resources should not be wasted on those who are disinterested in growth. Time and training is being invested only in high potentials and those who demonstrate an active interest in development. But instead of accepting this indifference, managers should be saying to all employees ‘grow or go home’ because in organizations today, the reality is ‘develop or die’. Employees who are not developing are actively lagging behind. Given the speed of business, the always-changing landscape and the ever-escalating expectations of customers and markets, you can’t afford for anyone to stand still. What got people to where they are today will fall miserably short of keeping them there… and cannot possibly allow your organization to thrive or even survive given today’s business conditions. As a result, leaders must re-educate employees and help anyone who thinks they’re ‘just fine’ to understand that, in absence of ongoing development, they are anything but fine. And leaders can do this with three short and clear messages designed to blow past the current (and disconcertingly accepted) inertia. Employees deserve and need to develop greater business acumen, understanding current conditions, customer expectations, and competitive threats. They should not be shielded from business realities, but rather educated about them. Well-informed employees will understand the urgency behind development when they appreciate the tremendous pressures facing the organization and the implications associated with not evolving and keeping pace. Growth Doesn’t Mean Going Anywhere! Many employees resist growth because they equate it with promotions and moves. 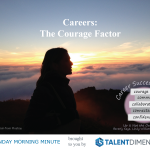 But someone who enjoys his or her current role rarely has to decline development for fear of changing jobs. Development in place is available to all employees – and should be a consistent expectation or requirement. One can always deepen or broaden their skills right where they’re currently sitting. Too frequently, employees believe that development is some sort of personal invitation, opportunity, or gift to them. They believe that declining it is no big deal because it affects no one but themselves. But this is self-involved thinking. Certainly, development benefits the individual… but it also benefits the organization as a whole. Deciding to say ‘no’ to growth doesn’t just condemn the individual to stagnation; it also limits the organization. 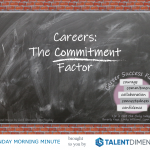 As a result, employees need to be reminded that it’s not just about them. So, as tempting as it might be to move those who aren’t interested in development off to the side and focus on those who actively step up to the opportunity, leaders need to challenge all employees to grow… or go home. This blog was originally posted on JulieWinkleGiulioni.com on August 6, 2014.